Starfsgreinasamband Íslands (SGS) – Federation of General and Special workers in Iceland, is a federation of trade unions in the private sector and part of the public sector. SGS promotes and works for the improvement of wages and rights of employees, safeguards the interests of employees towards employers and the authorities and provides various services to its trade unions and individual members. SGS is built up of 19 trade unions of general and special workers, with a total of around 68.000 members. SGS five main branches are food and agriculture, building and construction, service and tourism, industry, and public services. SGS is a member of ASÍ – The Icelandic Confederation of Labour. SGS is an active member of various Nordic, European and International organisations i.e. IN-Nordic, NU-Livs, NU-HRCT, NBTF, IndustriAll, EFFAT, BWI and IUF. The Icelandic Confederation of Labour (ASI) present a summary of labour law and trade union rights in Iceland on their website. There you can find information about trade unions and collective bargaining, employment contracts, wages and working time, holiday allowance, payments in case of accidents and sickness, health and safety in the workplace, maternity and paternal leave, information and consultation of workers, access of foreign workers into the labour market and other related issues. 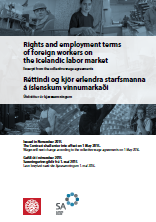 Information on Icelandic Labour Law can also be found on the ILO website – Iceland. Collective bargaining between the social partners has a long tradition in all sectors of the labour market. Wages and other terms of employment are set by the social partners and this method of regulating the labour market is strengthened by a specific provision of law which makes their collective agreements generally applicable and binding upon all workers and employers operating within the boundary of the applicable agreement, whether general workers, tradesmen, office workers etc. Worker’s rights are also protected in various pieces of legislation which deal with particular aspects of the employment relationship and the social rights of workers (legislation in english / health and safety). The focus is on the general or private labour market. The public labour market is governed by a different set of rules. We use both the concept of “worker” and “employee” – they meen the same so their use does not indiqate any diffrence. ASÍ´s campaign: Equal rights – no exeptions! ASÍ´s campaign against social dumping and undeclared work is aimed at companies that are abusing young people and migrant workers. It is not aimed at migrant workers that have come to Iceland to work trusting that everything is in order. Below you can get free information brochures about the icelandic labour market, workers rights and obligations in english.